Here is a photo out one of the windows in the St. Louis Arch probably in 1967, just before I left for college. When Matt and Sarah were freshly married, we all headed up to Bro Mark’s place in St. Louis for Christmas. When the Arch first popped into view, we started an elaborate story about how there is a tradition to lick the Arch the first time you visit it. I was impressed. She wasn’t buying it. She had wised up to the Steinhoff family pretty quickly. Mark and I took a ride from his house near the Botanical Gardens to the Chain of Rocks Bridge. I was surprised at how it was possible to get around on a bike in St. Louis. Here’s an account of our ride to Chain of Rocks. Here’s a shot of the riverfront and Arch looking south, possibly from Ead’s Bridge. If I’m wrong, I’m sure Mark will enjoy pointing out the error. That’ll be my birthday present to him. I can remember seeing the photos and reading the stories in The St. Louis Globe-Democrat about the building of the Arch. It’s a beautiful landmark that you can’t really appreciate until you get up close to get a feeling for its size. Hey Jim! Good to see your name. How are you? Great photos Ken. In the fall of 66 I lived in west county and worked downtown. On the drive in I watched the arch grow together at the top. At the end of the 90’s I lived in the building shown in the last photo and still work just up the street. the arch is something when you first see it coming from the cape side you get that arrived feeling(kinda like the old bridge was at cape) I remember making calls to st louis in the mid 90’s and there would be a picture of the arch in defferent stages on the wall. i often wondered if there was a story bout why one man had a picture more or less completed. did it mean that company was a contributor at some time during construction. Kinda like Knot hole gang.pictures. always felt there must have been more than just a picture of a bunch of kids trying to see the game. thanks again Ken for all your work. memories are more prcious now with ever funeral. My Father, Harry Stein, had his office on the top floor of The Ralston purina Company building. The last two years before he retire he had a daily view of the construction. He used to tell me he couldn’t wait to see if the two legs – being built simultaneously, would meet in the middle. 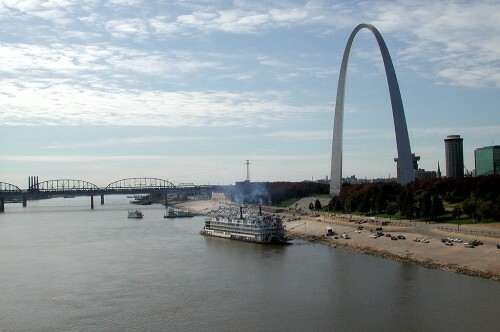 Born and raised in Cape, Dad loved the Mississippi riverfront view the forty years he worked at Checkerboard Square! The memory I have of the St Louis Arch was when my husband Paul Allison was in Viet Nam in 1969, me and our three children moved back here to Cape, near family. The school had a bus tour of the arch, which my daughter was on when news came that some crazy man flew his air plane through the arch. Charla came home telling me they were at the top of arch when the plane flew through under them. Of course there was enough stress in my life then, I didn’t need this but all turned out ok, so grateful for that. I remember reading the story of the guy who flew under the arch. The authorities were NOT happy. We Steinhoffs never lie, but we sometimes stretch the truth to where we can hear the threads starting to pull apart. Sarah and Wife Lila learned early on not to fall for some of our shenanigans. That skepticism was sometimes misplaced. Shortly after we were married, we were driving past a construction site when Dad made a comment about “sheepsfoot rollers” that the builder was using to compact the soil. “You’re not going to get me with THAT one,” she commented smugly. This and other things that happened in the 60s, like landing on the moon.. I wonder if we will ever see great accomplishments like this again, but I guess that is what makes these so unique. 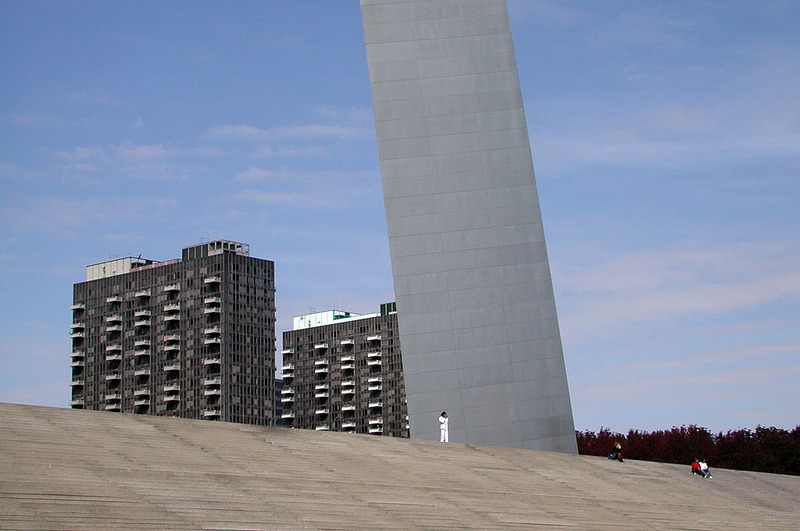 The paradox of a shrinking St. Louis and the increasing iconization of the Gateway Arch continues to amaze. One wonders whether the Jefferson National Expansion Memorial will eventually be used to represent the geographic growth race between Cape and Jackson. 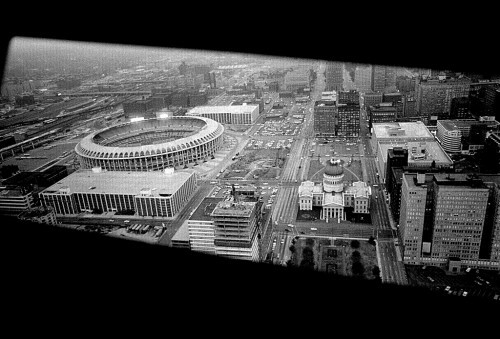 Before the Arch was finished, Erv Markhart and I drove up from Cape to St. Louis to see him Mom (and drag race on Hall Street). We were able to climb up some of the steps to the arch prior to the “cars” being made functional. They would only let us go up a couple of flights, but it was interesting anyway. Great memory! There is a great film, the exact name of which escapes me, about construction of the arch. It is worth a see, particularly at the end when the last piece is put in place … it had to be done early in the morning and cold water was sprayed on both “legs” to keep the metal from expanding in the sun. 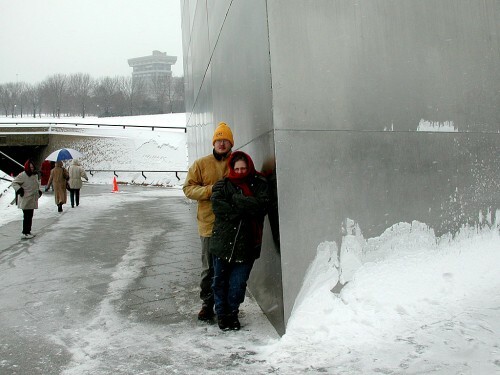 I’ve seen that movie, maybe at the Arch’s visitor center, and I’ve read the account of how precise the join had to be and how close they came to missing the precise window of time before the sun started warming one leg more than the other. It’s riveting, if you’ll pardon the construction pun. My Dad worked on the Arch, so it holds special memories for me. My husband’s company, Sach’s Electric did the electrical on the construction. On Sach’s 75th anniversary they rented the arch for their annual party….very cool to be able to take rides to the top wtih no lines! The movie on the construction is still shown in the arch theater. If you go make sure you see it. It’s awe inspiring…I’ve seen it many times and it still gives me goose bumps. As the north and south legs of the gateway arch reached each other for their completion, my father brought home from his office at the university (state college) the weekly edition of the Capaha Arrow. My fading memory recalls a cartoon with a drawing of the two legs not quite in precise alignment. In fact the the miss-alignment was quite pronounced. And the caption asked an engineer/architect if they had graduated from Southeast Missouri State College. Because he was a professor in the Industrial Arts Department he thought the cartoon was quite amusing. No word on what President Scully thought about is. I wish I had kept a copy of that edition. I thank you for your photos and essays.